I am always trying to find ways to get my kids to eat just a little better and sometimes all that entails is making something at home. It always takes a little more time to make it yourself but it is well worth it to know exactly what is going into your child’s belly. We are also always doing Easy Dinner Recipes on this site! Life with children can be so busy at times. There are so many preservatives in all those store bought breakfasts and they are just loaded with sugar! Now don’t get me wrong here……. my kids do it sugar but at least it’s called sugar and I put it there myself so I know exactly just how much sugar is in there! So next time instead of grabbing that box of pop-tarts or that sugary cereal you can make these scrumptious Raspberry Banana Crumb Muffins and at least know that they are getting some fruit into there diet. My kids gobbled these up in no time flat and asked if I would please make them again on Valentine’s day. They both gave me a big kiss also and that is always a plus! 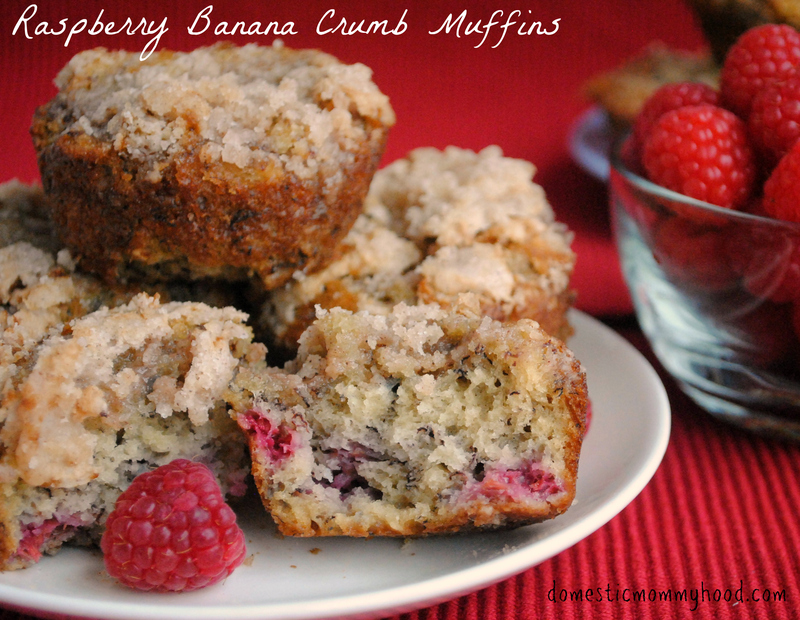 Read on to see how to make these beautiful Raspberry Banana Crumb Muffins!! 1) Preheat the oven to 350 degrees. Spray muffin tin with non-stick spray. 2) In a large bowl combine the mashed bananas, eggs, sugar and butter. In a separate bowl, combine the dry ingredients until well-blended. Slowly add the dry ingredients to the banana mixture. Stir in the berries. 3) Pour batter into muffin tins. 1) Mix together the flour, sugar, butter and cinnamon. Add approximately 1 Tbs. Of crumble mix to the top of each muffin. 2) Bake for 20-25 minutes. Crumble top will turn golden brown in the oven. Perhaps it’s because I am starving right now, but I am literally getting up to add the ingredients to make these to my shopping list as soon as I hit “post comment”. Those muffins look so moist and tasty. My Hubs loves raspberries so I am sure if I make these, he will be one happy camper. Those muffins look delish. I’m not much of a baker – but these are worth a try! Those look so good. I never would have thought to mix Raspberry and Banana in muffins. Sounds good! I definitely try to make sure to make the sweets my kids eat. And your pictures are fabulous! My gosh, these sound soooo good! I love muffins and definitely need to make these very soon! Your muffins look absolutely amazing! Now I am craving muffins, I might have to make some for breakfast tomorrow! These look amazing! Wish I had raspberries so I could make them tonight! I love raspberry banana muffins. I’m going to have to remember to add a crumb topic next time. This looks so delicious! I MUST make these for my kids. These look delicious. I love any banana bread/cake! Will have to try the recipe. The muffins look beautiful. I have such an addiction to bread. Muffins, donuts, cake, I’m hooked. 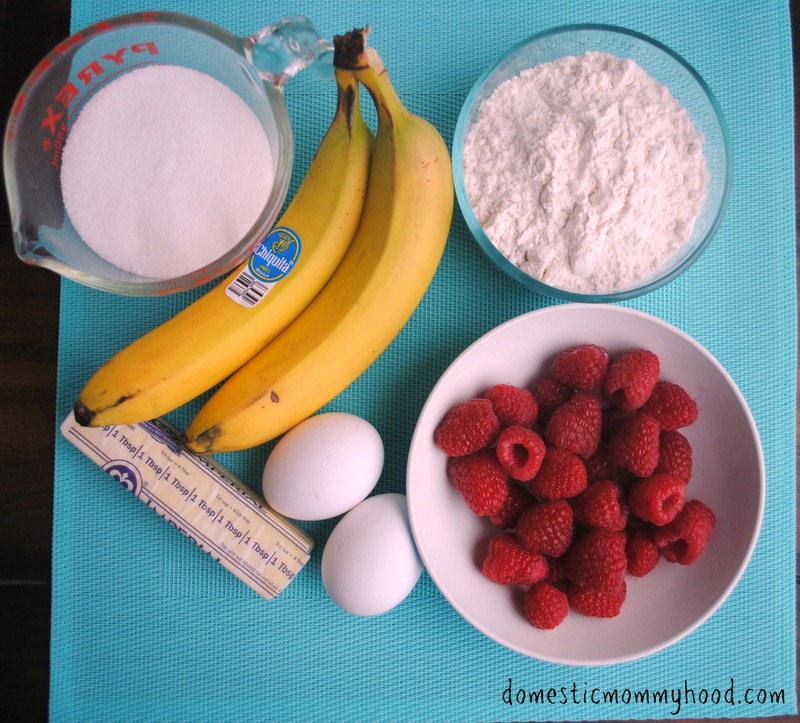 I love banana muffins, and those raspberries have to give it such a fresh taste. I love raspberry! Putting them in muffins sounds perfect to me! 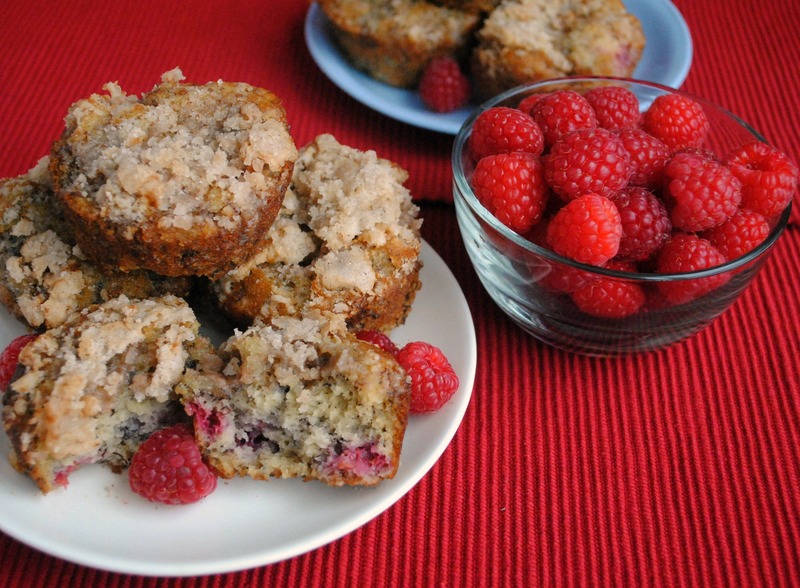 Oh my goodness, these Raspberry Banana Crumb Muffins look delicious! I’m a sucker for anything raspberry, so I am sure I would love these! Pinning so I can make these soon! Those look delicious! My fave muffin is blueberry but this makes me want to branch out. Those Raspberry Banana Crumb Muffins look delicious! If they taste as good as they look, then I won’t have any trouble getting my little one to try them. I’ve always eaten my raspberries right from the pint. I thought nothing could compare to their taste, alone. But this recipe may have just changed my mind. I think I’m drooling. We love having muffins for breakfast. I’ve never tried a recipe like this, especially with crumbs on top. The fresh raspberries are making me hungry! 🙂 I love this idea and it would be a perfect addition to my brunch! This recipe is awesome. Love that it’s made from scratch! Your muffins look to die for. I try to make muffins for us to have for those quick out the door mornings. I will try these for my next batch. This muffins look divine! I love raspberries because they are sweet and tart at the same time. They’d be great in muffins! My son would love these. They are perfect for an after school snack. That is soooooo fantastic. I wish I could have a bite. Please share! these look yummy. i am going to try these. i like the fresh ingredients. These look amazing! I think I might have to sneak some dark chocolate chips into mine! Yummy! These look amazing and contain all of my favorite ingredients! How could someone not love them?! Oh this looks like something I just have to make. Just looking at it and the ingredients are alll that I want to try. Yummy! These look absolutely amazing! I’m not sure why, but I rarely make muffins for my kids. I have an ongoing list of recipes to make one of these days and I’m adding this to the list! Your crumb topping looks like it turned out really well. It looks like all the same ingredients I have used before, but somehow yours is prettier than mine. I will have to try this recipe, specifically for the topping. Thanks for coming by the Wonderful Wednesday Blog Hop. Love your post and appreciate you taking the time to share. I will be featuring this fabulous post Thursday on Facebook and Twitter. Pinning today! Love banana muffins with fruit. I have tried strawberries in my muffins and now I wonder why I never thought to try raspberries. Thanks for the inspiration and for sharing on Wonderful Wednesday. This looks delicious! I just started a new series called Eating Inside the Box it would be awesome if you would share this with us! Please linkup any other recipes to any fruit/veggie category you’d like! My kids would love these! Thanks for linking up with What’s Cookin’ Wednesday!